Alex O’Neal, Shrine To The Stoners and Bank Robbers Of My Youth, 2015, acrylic, collage, marker, and graphite on canvas, 34 X 78 inches. 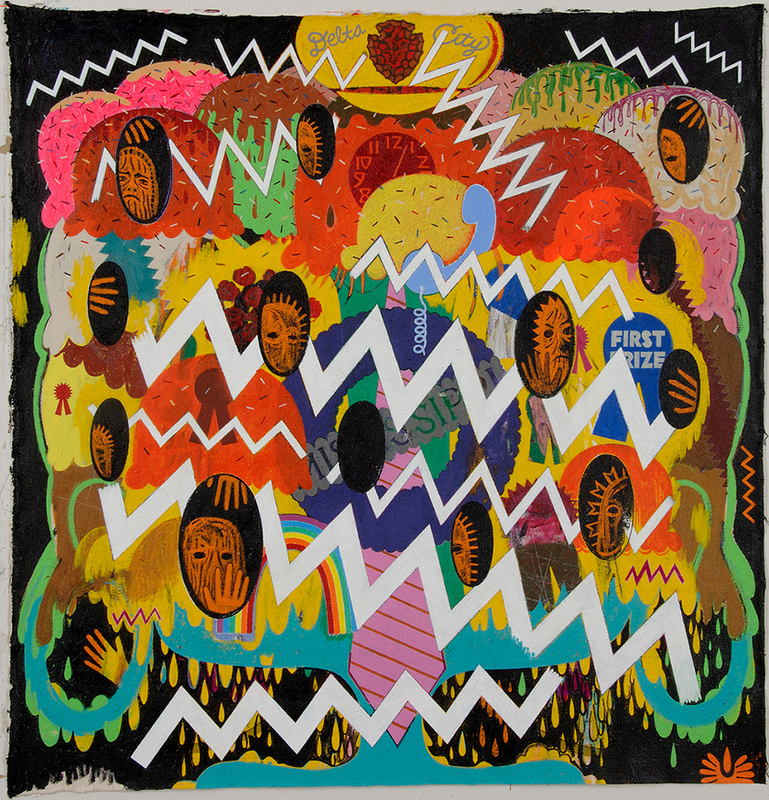 Contributed by Katarina Wong / Alex O’Neal is an artist based in Cooperstown, New York, whose recent show “Hiding Places in a Dream” at Linda Warren Projects in Chicago was a visual knock-out – a dizzying array of hyper-saturated canvases balanced with intimate, small-scale drawings. Throughout the exhibition, O’Neal continues to develop his highly personal visual language. Raised in the Mississippi Delta, O’Neal’s earlier work was populated by a crew of eclectic misfits, glam hippies, and outlaws that reflected the unease of the late ‘60s and early ‘70s. His paintings and collages portrayed a world as it would have felt to a child coming of age in the deep South at that time: mysterious, slightly dangerous, and also hypnotically appealing. In New Looks and Accessories for the Delta Scene, for example, the figures stand in the foreground – fort-like and defiant – challenging us to stare back. Alex O’Neal, New Looks and Accessories for the Delta Scene, 2009, oil pastel on paper, 32 X 49 inches. In “Hiding Places in a Dream,” though, O’Neal shifts from predominant figuration and allows objects to carry more of the narrative weight – in effect, creating re-contextualized vanitas paintings. In Groupies Of The Shrine Façade, a pivotal piece for O’Neal, a row of 19th-century grandfather clocks seem to mirror the line-up of hippies in New Looks and Accessories. In Groupies, though, the clocks form a barricade on which minions of miniature glam hippies stand ready for battle, blocking us from seeing the clocks’ faces. With the clocks rendered ineffective as timepieces, how are we to understand them? Are the small figures protecting us against the passage of time – or vice versa? Throughout the show, O’Neal continues to draw on personal experiences to drive the formal construction of his work and its meaning. The zigzag motifs, for example, originated from his experience of intense migraine auras. The auras became design elements as well as signifiers of a charged environment. Even though these flowering thistles grow very close to the ground, I loved the idea of a kind of enchanted thistle tree. I was suddenly inspired to travel back to Farrera to get in touch with this flower again. It was one of the most essential and poetic things that I ever wanted to do. His piece, Façade of a Catalan Pilgrimage With Self-healing Bears And A Falling Flower, was the first of several pieces resulting from that touchstone experience. Alex O’Neal, Façade of a Catalan Pilgrimage With Self-healing Bears And A Falling Flower, 2016, acrylic and graphite on canvas, 84 X 72 inches. O’Neal tends to pack all of the action in the foreground of his paintings, so much so that it feels as if the air has been purposefully sucked out of the space. People and objects, painted and collaged, overlap to create walls of visual information and a tension between what is hidden and what’s revealed. Flags, veils, funerary wreaths, even closed eyes make it difficult to know if the barriers in his pieces are meant to keep viewer out or to protect those within. Is there something behind the wall of images? Or are these overwhelming images meant to guard us against an emptiness looming behind them? Fetish-encrusted objects meant to obscure our view or divert our attention, facades and shrine appear to function similarly for O’Neal. Pieces like Shrine for Ice Cream Royalty are reminiscent of homegrown shrines such as the Sanctuario de Chimayo in northern New Mexico, a place that O’Neal has visited. Renowned for its “holy dirt,” pilgrims come from far and wide to visit the Sanctuario both to access the miraculous soil as well as to leave behind evidence of its power. The outer chapel is filled floor-to-ceiling with crutches, photos, votives, rosaries, hand-drawn images and hand-written prayers, all creating an atmosphere overwhelming in the hope and sadness represented by those objects. 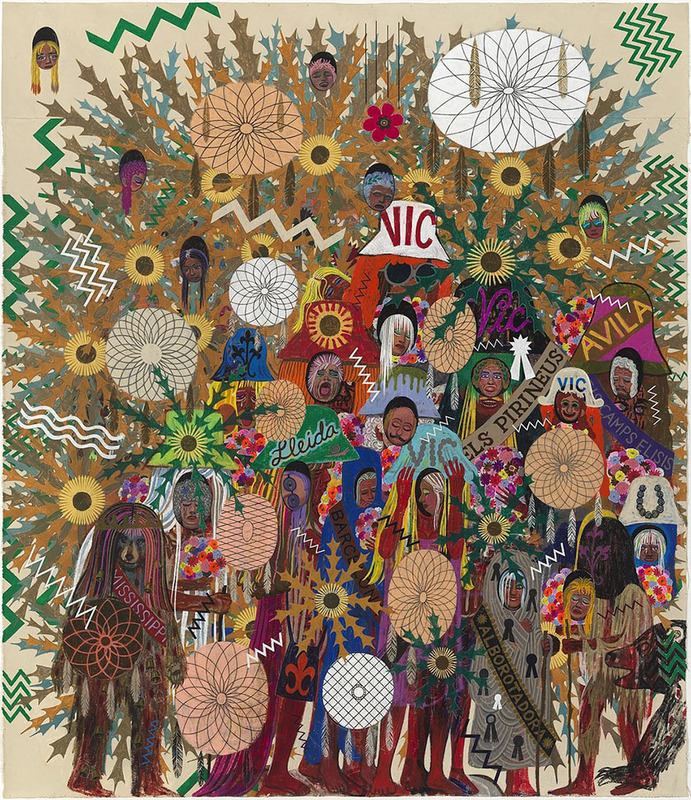 Alex O’Neal, Shrine for Ice Cream Royalty, 2012, acrylic and collage on canvas, 84 X 132 inches. In contrast, O’Neal’s recent drawings focus on a more reflective aspect of shrines. Yet lest they become too encumbered by the heaviness of death, he infuses a quiet humor into them. These shrines, inspired by New England school girl watercolors and needlework, monumentalize and also poke fun at our human frailties, from O’Neal’s worry about ending up as a forgotten artist living out his final days in a Yonkers nursing home to artistic ambitions mocked as giant ice cream cones melting under funerary veils. These are quieter pieces, not just because of their more limited palette but also in the artist’s willingness to allow space and air into them. The images function less as guardians and more as mirrors of our existential fears. Alex O’Neal, Yonkers Nursing Home Shrine, 2013, graphite on paper, 9 X 12 inches. Alex O’Neal, The Singing Dream Façade (When Flowers Fell on Tarragona), 2016, graphite on paper, 14 X 17 inches. Alex O’Neal, Ice Cream In Mourning (Cherry Valley Daydream), 2014, art marker on paper, 18 X 24 inches. Throughout “Hiding Places in a Dream,” O’Neal infuses his work with deeply personal experiences and an expansive love of art history. In his unique way, he connects early American mourning art, contemporary funerary swag, rural devotional experiences, and Northern Renaissance vanitas paintings. The tales they tell are far from solipsistic, though. Like the blind poet Homer, they sing stories of the mysteries and unanswerable questions that lie in our ambitions and our beautiful human frailty. “Alex O’Neal: Hiding Places in a Dream,” Linda Warren Projects, Chicago, IL. December 17, 2016 through February 11, 2017. About the author: Katarina Wong is an artist and the founder and curator of MADE, New York. She is also the program manager of the Arts Administration graduate program at Teachers College Columbia University. Follow her on Instagram, Facebook and Twitter. Hey Alex, finally viewed your work on this site…very intense. I was especially drawn to the haunted ice cream piece as I, too, occasionally experience the migraine auras, and your depiction is spot on. Keep creating!